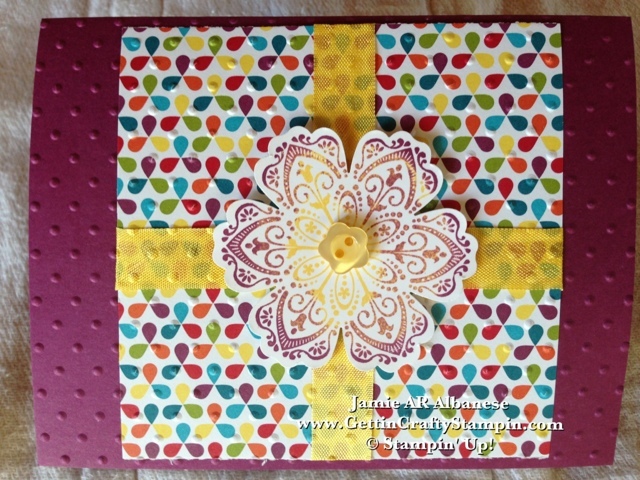 I can't resist a Bright, Bold and Cheery Card! 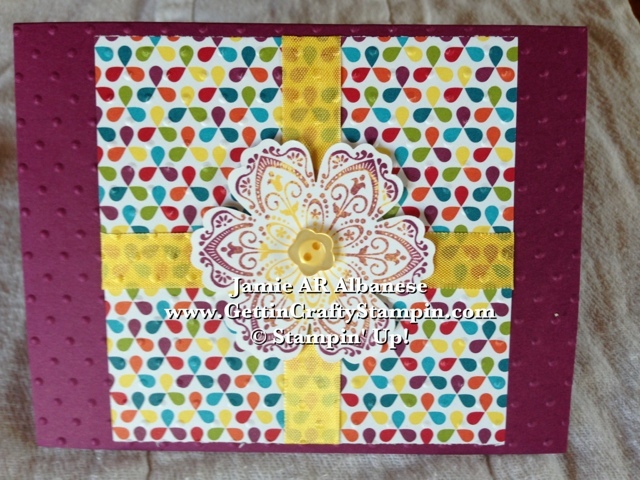 With a Rich Razzleberry (#115316) card stock this card is sure to brighten ANYONE's day! Our Summer Smooches Designer Series Paper (#125409) is a fun and funky way to brighten it up! Wrapping this 4" x 4" in our 1/2" Seam Binding Ribbon in Daffodil Delight (#125583) adds to the sunshine feel of this card. Layering the Card Stock, Designer Series Paper and Ribbon before running it through the Perfect Polka Dots Textured Impressions Embossing Folder (#117335) and Big Shot (#113439) for this fun polka dot embossed element. Giving our Mixed Bunch flower stamp (125537) a fun Rock and Roll inked look is easy! (See the technique below in a video I'd done a while back.) 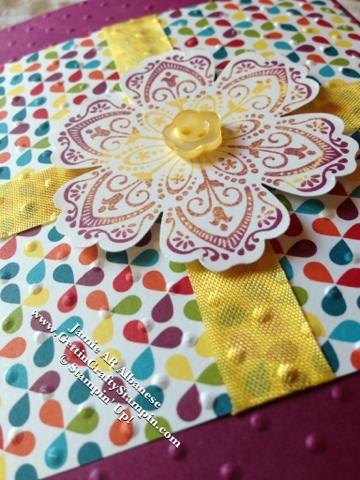 Stamp the whole flower in Daffodil Delight ink (#126944). Roll the edges in Rich Razzelberry ink (#126950) for this variegated look. POP it out with our coordinated Blossom Punch (#125603) for a quick die cut! POPS of Color, Texture, there is nothing Dull about This Card! Who would YOU give this to? Button this up with our Brights Designer Buttons (#119747). They coordinate perfectly with our card stocks, inks and ribbons! Sending Loving Thoughts (#125845) is easier than ever with this elegant and lovely stamp set! Stamping it with our Rich Razzelberry ink (#126950) on our Whisper White card stock (#100730) for a sharp look. I LOVE it! I love adding a zing to life, cheering my day with POPS of Bright, Bold Color! When the day is Grey (either by weather, smoke coverage or life's rough treatment...) it's easier than ever to Brighten with a card like this. CLICK HERE to See ALL of our Amazing Products, the Retiring lines that are discounted up to 65% and all of our Specials. 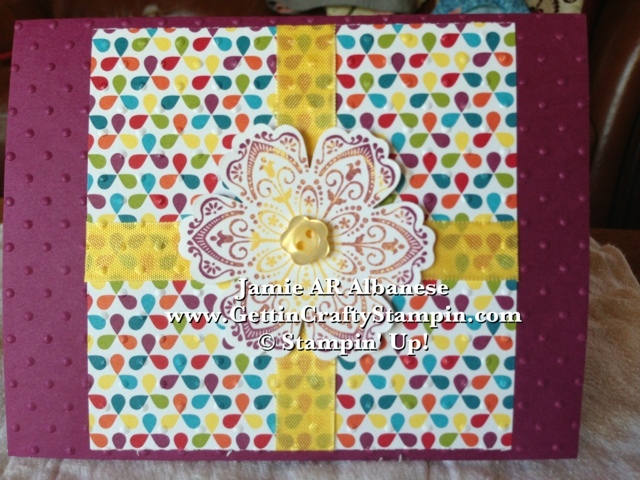 Save when you select ME (Jamie Albanese) as your Demonstrator for all on-line orders! but the technique is timeless and doesn't change! !